Nuke Pro: "Fluoride Stare" -- Do People Just Not "Get It" Anymore, Or Do They Get It But Just Don't Care? 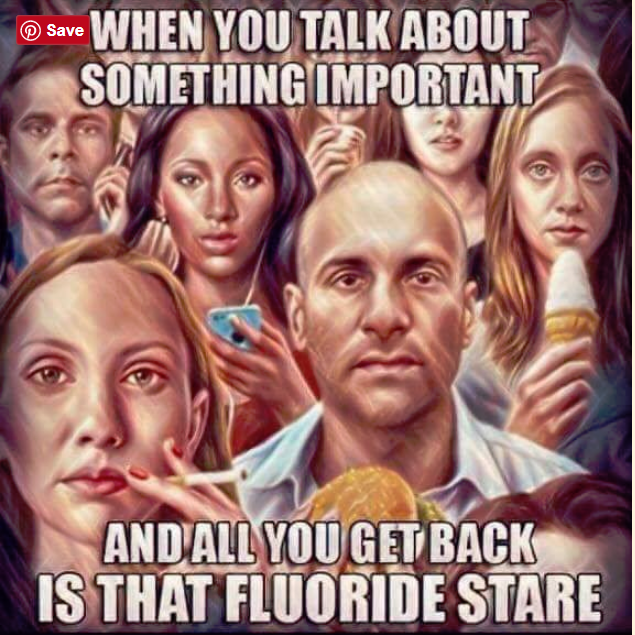 "Fluoride Stare" -- Do People Just Not "Get It" Anymore, Or Do They Get It But Just Don't Care? So how to "get rid" of this nuclear byproduct? Put it into municipal drinking water at "low levels"
Downblending is becoming more and more "popular". But when you have 100 toxins entering your water, air, and food everyday....and non are at toxic levels, but combined....we are all sick, fat, and cancerous. Time to wake up, before corporate and governmental idiocracy kills us all. This study from Harvard shows an average IQ drop of 7 points among 14 year olds that drank fluoridated water. If that isn't enough to "stop the madness" what is? stock here: Above point, is well, exactly my point. "Scientists" do study after study to show that "we cannot prove that this chemical at these levels, sor sure causes harm". And that is the great lie, the combined damage from 10 or 100 chemicals is what is taking us down. What follows is a blatant plagarism from a reader. trump that. 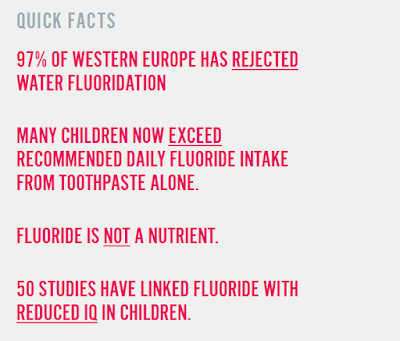 decades of official assurances that water fluoridation is safe and effective. It seems that some black folk got uppity when they noticed new science saying they were disproportionately harmed by fluoridation in relation to the rest of the population. It really bent the CDC dental office when it learned that Andrew Young, one of Martin Luther King's closest associates, was asking questions and taking names. That sent them off in a tizzy to the trade org that sets standards for the dental industry. What standards; what assurances? It turns out that the library of CDC and ADA studies showing safety and effectiveness is scant to non-existent. "Oh no! What to do? ", cried the emails passing between Atlanta and Chicago. This month marks the fifth year since the City of Fairbanks, heeding the call of its residents, turned off the fluoride pumps. Sixty years of running down a cold trail; affected DNA will require years to recover but at least the mistake was corrected. Anchorage has yet to awake from its stupor, where it dumps tons of microbe-killing poison into the watershed before finally taking residence in beluga whale and salmon habitat. If you know Anchorage folks who ought to be paying attention, turn their heads north. Gently. One of the symptoms of fluoride exposure is muscular stiffness. Fluoride’s crippling effect can be tackled by Jamun seed,"
One study: "This paper reviews the human health effects of fluoride. The authors conclude that available evidence suggests that fluoride has a potential to cause major adverse human health problems, while having only a modest dental caries prevention effect." One more quote from the link "Fluoride has modest benefit in terms of reduction of dental caries but significant costs in relation to cognitive impairment, hypothyroidism, dental and skeletal fluorosis, enzyme and electrolyte derangement, and uterine cancer. Given that most of the toxic effects of fluoride are due to ingestion, whereas its predominant beneficial effect is obtained via topical application, ingestion or inhalation of fluoride predominantly in any form constitutes an unacceptable risk with virtually no proven benefit." "Fluoride’s crippling effect can be tackled by Jamun seed,"
Some good news for a change - On November 22, 2016, a coalition including FAN, Food & Water Watch, Organic Consumers Association, American Academy of Environmental Medicine, International Academy of Oral Medicine and Toxicology, Moms Against Fluoridation and several individual mothers, filed a petition calling on the EPA to ban the deliberate addition of fluoridating chemicals to the drinking water under provisions in the Toxic Substances Control Act (TSCA).